With what seems like the longest winter ever i think it's about time to take a break from all those winter pieces and just have a spring fling moment with some colors. How so random is it to find a pair of pants that fits you like a glove? Because for me, it is one out of a million. Finding this pair of mustard yellow pants got me all super inspired to create a colorful look but it all depended on one thing. The ultimate one thing every girl shopping for a pair of pants always hopes for- A PERFECT FIT. And it did. The cool thing about colors is, they often compliment each other. So i guess creating a fun colorful look involved putting together a few of my favorite colors. I guess with these pretty colors i could just skip Spring and go right to Summer. Nice outfit for welcoming spring, I love your blazer. Another great color combination, I love those pants! You look so perfect! Great outfit! 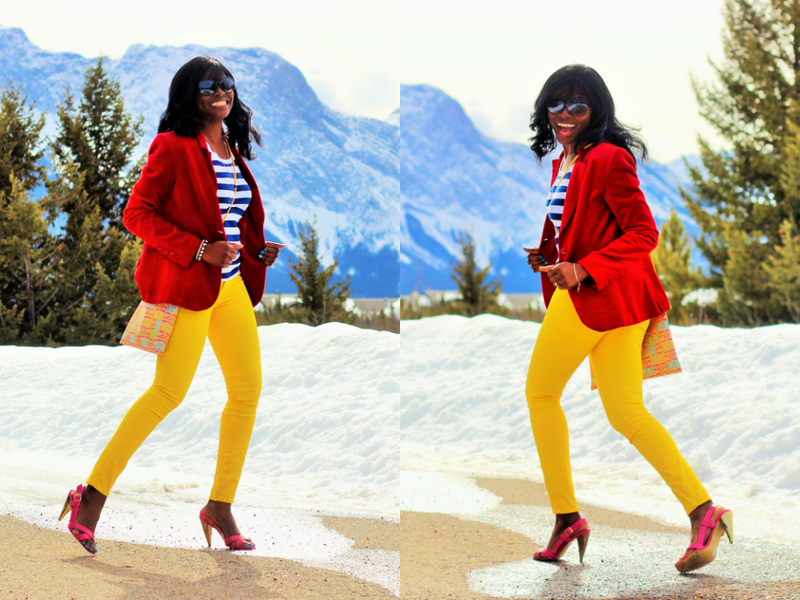 Love the clash of colors in your outfit Busola! Nice Look ! Great colors!!! Nice Look ! Great colors!! I love how you are able to mix these colors! love the vitaminc look! Beautiful spring color combination love the shoes you look stunning doll. Wonderful outfit, it really brings 'spring' to mind. The stripes even give somewhat of a summery feel, so it's spring/summer kind of look. I really like it! You are the Queen of colors!!!!! Another amazing look, perfect for spring!!!!!!! Your colorful outfits always brighten up my day!!! beautiful colors on you and the stripe shirt looks stunning on you! I love this colorful outfit!! Just perfect pop of color for a cold winter day.. Very nice! Love these bright colors! Yay you're wearing stripes, I love this timeless print and those canary yellow pants are so attractive, you are like a ray of sunshine even on the coldest winter day in your beautifully bright outfit. I am grateful for your kind comment over at mine. I love the colors of your look! Such a pretty color blocking! It really is next to impossible to find the perfect fitting pants....glad you were able to! I love all the colors going on here...too fun! such a beautiful color combination again! i so love stripes! and those pants look great on you! Ok babe... You're my muse!!!! This combo is awesome. You look stunning and lovely. Your feet look so pretty in those sandals. I like!! So colourful - you look so perfect!! molto carini i pantaloni (; Reb, xoxo. Busola, yes what a perfect fit! But then again, you do have those perfect long legs. Loge the way you styled them with the stripes and bold colors, and it adore that bag! happy spring! finally ! Loving the bright colors on you! Especially the nail polish, you better believe I peeped those. Also, can we give you an award for constantly braving the elements to give us the latest fashion inspiration? Those colors are popping! You look great dear. SORTEO: GAFAS STELLA MCCARTNEY! PARTICIPA YA! Wowsers!! love these colors together! I never would have tried this combo but it most definitely works!! Sweet and hot! This is absolutely fantastic. I like that you are so brave in colour combination within this outfit. Fits perfect. I love it. Wow, love everthing about this fun and colorful look. Those sandals are so cute.